Gwyn Hanssen Pigott began to compose her functional pots into still life groups in the 1980s. Her subtle combinations of colours and shapes are reminiscent of the still lives of the Italian painter Giorgio Morandi (1890-1964). By referring deliberately to fine art traditions, Hanssen Pigott changes the context in which her work is seen. A group of useful domestic pots becomes a single work of art. Two bottles, goblet and beaker of Limoges porcelain and glazed. The four object are to be displayed in a still life arrangement. 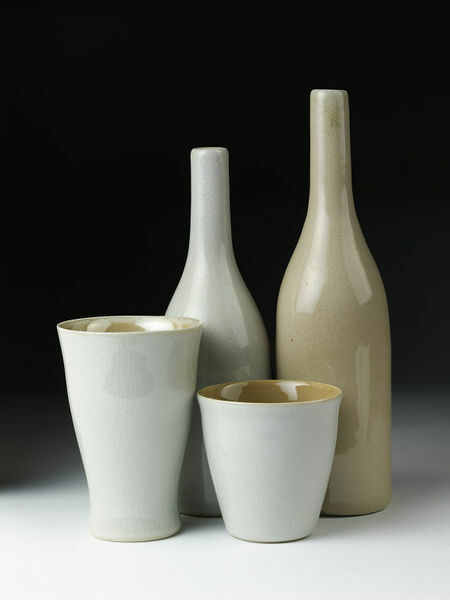 Group of two bottles and two cups, Limoges porcelain with pale blue and beige glazes, Gwynn Hanssen Pigott, Queensland, 1992.